We “behaviorally modern humans” likely emerged more than 100,000 years ago in Africa, spread across that continent and eventually all over the planet, effectively replacing all closely related potentially competitive species. Among many possible explanations, one key to our consistent success in such replacement was the ongoing interactive gene-culture co-evolution of the human brain mind with tool use and technology that began much earlier––ranging all the way from simple stone tools millions of years ago, to computers today. 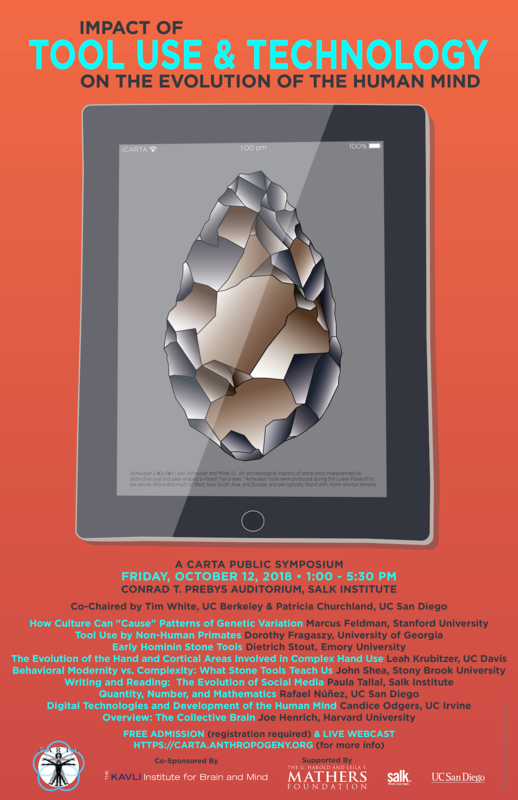 This symposium will address this important gene-culture co-evolutionary process in anthropogeny at all levels, ranging from molecules to brain imaging––beginning with the potential link between early stone tool use and the parallel expansion of the human brain, to the control of fire and the invention of projectile weapons, all the way through reading and writing to current day technologies such as computers and 3D reality––perhaps with a look to the potential future of the human mind, under the impact of continually evolving culture. Appropriate comparisons with other living and extinct species would be included, as will attention to other relevant cognitive features unusually well-developed in humans, such as language, theory of mind and cooperation. An underlying question relevant to anthropogeny was first posed by Wallace: how did the human mind originally evolve such remarkable capabilities in Africa, “in advance of its needs”? After all, even today no human is born with the genetic capability to make even simple stone tools? A glossary for this event is available as a Searchable List.